I've always enjoyed the tidbits Lydia shared in her cookbooks and show about her family and history. this brings it all together. Lydia's story is inspiring, entertaining, and might make you hungry for a classic Italian dinner. For decades, beloved chef Lidia Bastianich has introduced Americans to Italian food through her cookbooks, TV shows, and restaurants. Now, in My American Dream, she tells her own story for the very first time. Born in Pula, on the Istrian peninsula, Lidia grew up surrounded by love and security, learning the art of Italian cooking from her beloved grandmother. But when Istria was annexed by a communist regime, Lidia’s family fled to Trieste, where they spent two years in a refugee camp waiting for visas to enter the United States. When she finally arrived in New York, Lidia soon began working in restaurants, the first step on a path that led to her becoming one of the most revered chefs and businesswomen in the country. 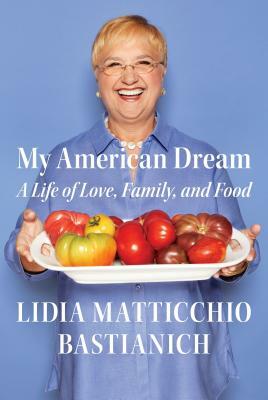 Heartwarming, deeply personal, and powerfully inspiring, My American Dream is the story of Lidia’s close-knit family and her dedication and endless passion for food. "Restaurateur, cookbook author, and TV host Bastianich offers an ebullient, nostalgic memoir of her journey to success... A warm story of a life buoyed by resilience, determination, love of family, and food." "Chef and restaurateur Bastianich offers a look into her culinary background in this charming memoir… Through her lyrical prose, she also encourages readers to find the bright side of any situation. This is a welcome addition to any food lover’s library." "In this memoir, restaurateur, television star, and cookbook author Bastianich personifies the American dream. …the grande dame of Italian cooking in America... Bastianich’s story holds even more significance for her triumph in a male- dominated industry." "it is a touching (and timely) read." "It paints a loving and often mouth-watering picture of her culinary adventures."